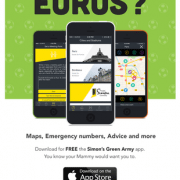 The Dublin Simon Community are proud to support the launch of the ‘Simon’s Green Army’ app, which will be available to download for FREE for fans travelling to Euro 2016 this summer. While providing useful information for Irish fans abroad, the app informs fans about the services that the Dublin Simon Community provide and the growing issue of homelessness back home. The app was developed by Andy O’Sullivan, an app developer based in Dublin and a supporter of the Dublin Simon Community. Andy created the app because he wanted to do something to help the green army stay safe abroad. This innovative app will offer fans a host of useful features to ensure that they have fun, stay safe and arrive back home after hopefully a successful tournament for the Irish National football team. Info on Dublin Simon Community – The app provides information on the services that Dublin Simon Community provide and offers fans an opportunity to support these life saving services. Maps – The app will include detailed maps of the host cities with information such as ATMs, bars/restaurants, train stations, Fanzones, stadiums, tourist spots etc. Where are you sleeping – This will allow fans to store their accommodation details in the app. They’ll then be able to access the details without Wi-Fi connection. This is sure to offer fans piece of mind when trying to find their hotel late at night. Set a meeting point – Similar to the above, you’ll be able to locate a place/area on the maps for you and your friends to meet before or after the Ireland games. When it all goes a little pear shaped – This is a page full of emergency contact details including the police, ambulance, Irish Embassy, Department of Foreign Affairs, plus much more and will ensure fans have all the contacts they need in case something goes wrong. Fan advice – there’s also some advice to fans from Ex-League of Ireland footballer Robbie Martin. The Irish Embassy and The AA are already on board to offer advice to fans through the app and on social media. The app also provides the Dublin Simon Community an opportunity to inform people about the ongoing homeless crisis. 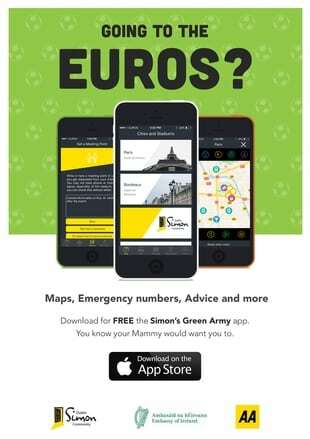 Simon’s Green Army app is available to download form the app store on iTunes by clicking here and on Android here. The app will be released shortly on Android and fans can also keep up to date with all of the latest news on social media – Twitter and Facebook by following the hashtag – #SimonsGreenArmy.